Box It in League City, TX was established in 1988. Our customers appreciate over 25 years of proven expertise and exceptional service. Locally owned and operated, our success is built on exceptional service and positive customer experience. We specialize in properly packing fragile and high-value items, including frames, electronics, crystal, china and porcelain. We have great parking and usually there is no waiting for service. At Box It, you don’t need to go all over town trying to find the best way to ship your package. Box It is a UPS Authorized Shipping Outlet, a FedEx Authorized Ship Center and a DHL Authorized Shipping Center. We have to abide by strict regulations to maintain our authorized relationship with these companies so you know your package is in good hands. In addition, we also ship via U.S. Postal Service and various freight companies. This gives us a variety of shipping and mailing options, so we can provide you with the service that best fits your needs—both for budget and speed. We can ship across the state, across the country or across the world. . We can even help you move through the airport a little quicker with our luggage shipping services. Packing Supplies include over 100 different box sizes. Packing materials such as bubble wrap, peanuts, corrugated sheets and packaging tape are available. We can even custom-make a box for those car bumpers or rocking chair. Drop off services for your prepaid UPS, FedEx & DHL package returns is welcomed. 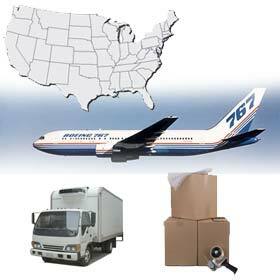 Ask about our freight services!